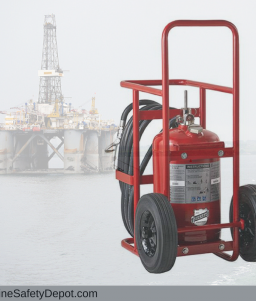 A rugged steel cylinder and wheeled model frame treated with a galvanizing compound undercoat, baked-on enamel top coat, and protective clear coat finish to prevent corrosion and fading from exposure to sun and sea. Stainless steel operating levers, plated brass valves, and plated brass guard around pressure gauge provide additional damage protection against the ravages nature can deliver. Components are tested and pass a 3000-hour salt spray test for added protection. 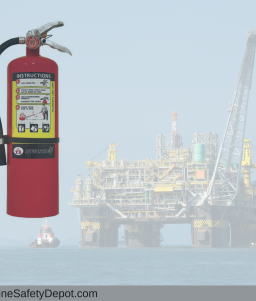 Halotron primarily used when extinguishing fires involving sensitive electrical equipment as it will not leave a corrosive residue, does not cause a chilling effect on electronic components, does not need to be cleaned up after the fire is extinguished, and can be used on Class A, B, and C fires.